The Montgomery County shooter is still at-large. At least five people were killed today during a shooting spree in three suburban Philadelphia neighborhoods. 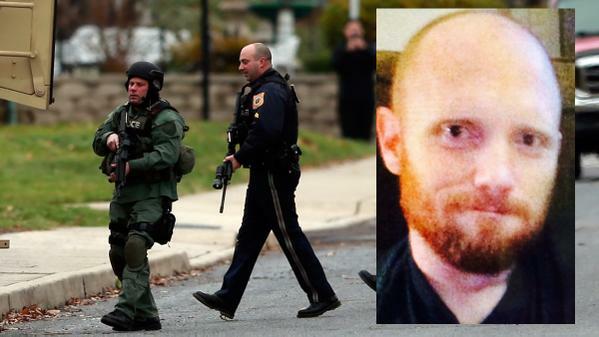 Police identified the shooter as a former Marine, named “Bradley Stone” who shot his former wife this morning. The suspect’s children were found unharmed at a neighbor’s house. One of at least five people killed in a series of shootings across Montgomery County, Pa. is the former wife of the at-large suspected gunman, published reports said. The suspect, whose first name is Bradley, remained on the loose as of 1:45 p.m., according to MCall.com and NBCPhiladelphia.com. He is a former marine, reports indicate. The shootings began before dawn when the gunman’s ex-wife was found dead in a second-floor apartment in Lower Salford. A man removed two girls, ages 5 and 7 from the apartment and fled in a car shortly after 4:45 a.m/. The children were later found unharmed at a neighbor’s home, 6abc.com reported. Thirty minutes after the first shooting, two people were killed by gunfire in Lansdale, according to 6ABC.com. Later, SWAT teams responded to homes in Souderton and Pennsburg but didn’t find the gunman. Authorities entered one home and kicked down a door and fired gas canisters into the other residence, but haven’t located a suspect. A seriously injured man not believed to be the gunman was taken by ambulance from the Souderton home, Philly.com reported. UPDATE: Former Marine Bradley Stone is still missing at 11:40 PM Eastern. The authorities still have not found him.